While I personally love them, many people consider wild strawberry plants (Fragaria spp.) as nothing more than weeds—weeds that they want gone! So if you happen to be one of these people and want to learn how to get rid of wild strawberries, keep on reading. How Do You Get Rid of Wild Strawberries Growing in a Lawn? So how do you get rid of wild strawberries? One of the best forms of wild strawberry control is prevention. A good, healthy lawn keeps weeds to a minimal. Wild strawberries thrive in moist soils. Therefore, improving any drainage issues and aerating the lawn when necessary will help reduce their appeal to your lawn. Watering infrequently will also help to slow its encroachment. 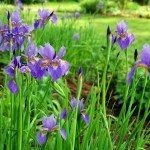 Once this plant has taken hold in the lawn, it is oftentimes difficult to get rid of. Wild strawberries are perennial, which means they survive winter and will happily return the following season. In addition to spreading through runners, new plants can also start from seed, which may be dropped by birds or other animals that have eaten the fruits. While physical removal is not that hard, the number of runners can link plants several feet away, making it difficult to get all of them. Herbicides are effective, but not everyone likes to use them. However, there are other options you could also try. Corn gluten meal – Corn meal is an organic weed preventive that can discourage new sprouts of wild strawberries. Vinegar – The option of vinegar weed control is oftentimes temporary in that the vinegar usually only kills the top growth of wild strawberries, so there’s a good chance the strawberries will regrow. In addition, it may also kill the surrounding grass, so applying it in the lawn may be tricky. Flame weeders – Flame weeders are simply propane torches that burn weeds. However, this method will also take out the grass along with the wild strawberry weeds. If you go with this approach, reseeding the bare patches of lawn will be necessary. Spot treatments of wild strawberry herbicide is probably one of the most effective means of getting rid of wild strawberry patches. In fact, most broadleaf weed killers work well on wild strawberries. They can usually knock out weeds without harming grass, making it a good option for lawns. As with any type of chemical control, these must be used with care, so read and follow all label instructions. The most effective types for use on wild strawberries generally contain three different herbicides (called three-way herbicides), such as Trimec. Keep in mind that wild strawberry herbicide is not always foolproof. Plants are prone to re-emergence, so additional applications may be necessary. Broadleaf herbicides should not be applied during hot weather. Since wild strawberry weeds (and other broadleaf types) are more susceptible to herbicides when they are actively growing, it is better to wait until temperatures cool off—with mid-spring or early fall applications being the best time. Do not spray these herbicides around on breezy days or near ponds and other water sources. 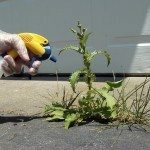 You should also wait until there is rain to stimulate the weeds growth before applying a herbicide, but don’t apply during rain to avoid runoff. Now that you know how to get rid of wild strawberries, with or without the use of chemicals, you can enjoy a weed-free lawn.